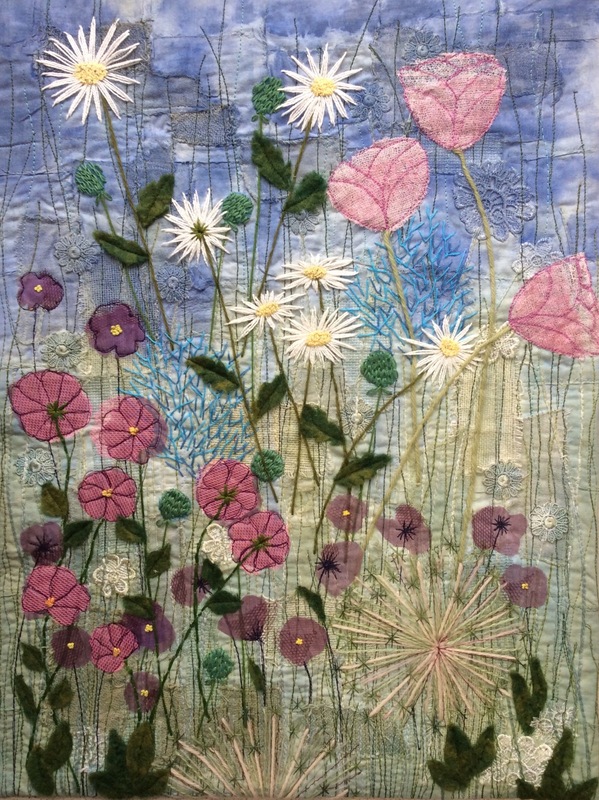 This is my finished “Summer Garden” piece which, you can see here, was started back in September. The challenge was to create a 20″ x 15″ quilt using pieces of fabric no larger than 3″ in any direction. To be true to the challenge I made a background consisting of forty eight small squares machined together and layered this with small scraps of fabric and stitch as demonstrated in the Wendy Dolan book Layer, Paint and Stitch. Love the stitching on this! Thanks Ruth. I really enjoyed doing this quilt but glad it’s finished as we start our next project at Cranwell this week. Thanks Laura, better late than never! It is lovely. Well done. I seem to have lost all inspiration. Hope it returns soon.. Thanks Sheila and I doubt you will be without inspiration for long!